Book cheap Greyhound bus tickets online, find schedules, prices, bus stations locations, services, promotions and deals. Busbud is an authorized Greyhound ticket seller. Dedicated customer support 24/7. Busbud and Greyhound are official partners. Busbud helps find, compare and book Greyhound bus tickets online in an easy and secure way. Greyhound Lines Inc is owned by FirstGroup and operates as Greyhound in the United States, Greyhound Canada in Canada and Greyhound de México in Mexico. With a long history in North America linking to Mexican and Canadian routes, Greyhound serves over 3800 locations across the territory. 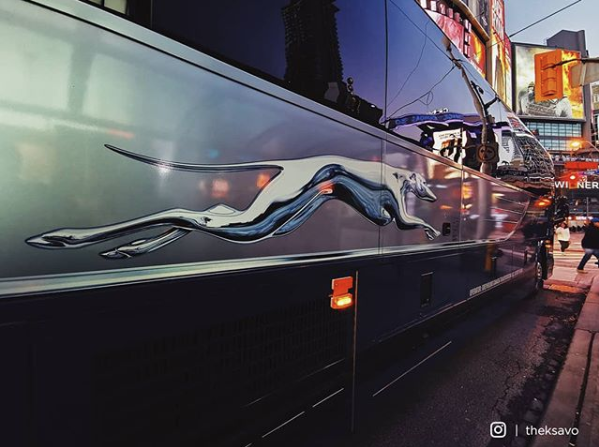 With over 1,700 buses and 18 million passengers each year, Greyhound is the leader in city-to-city bus travel in the United States. 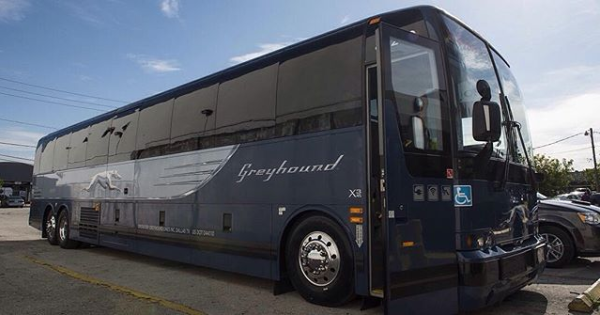 Greyhound is part of a network of bus companies (as well as Amtrak) which sell tickets on each other’s routes to allow connections to even more locations, including rural routes through Greyhound Connect. All their buses include toilets, free WiFi, and reclinable seats. Busbud has been an authorized seller of Greyhound bus tickets since 2014. You can easily find the fastest, cheapest, and best-rated Greyhound bus departures on Busbud - at no additional cost! Bus smelt like urine, it was an awful trip. Driver was quite rude. Drivers are great !! Departures happen to be too early ( 5minutes ) Arrivals can be up to an hour later, even if roads are clear. It would be great if the same trip could take shorter time. Good driver, very efficient. There was old strawberry jelly on the sides of the bus though so I would say cleanliness was the only thing not up to standards. Bus driver made a very sweet announcement at the beginning of the trip that was appreciated by all. It is a good service! There was a 1 hour delay in Richmond, VA., otherwise all was well. Wifi was provided and electricity, I was able to charge my phone. This was excellent! Horrible experience on my first stop on US. I was on Canada, and everything was perfect. This company doesn’t has respect with customers. I love grey hound trip was wonderful I will be booking again and No I am not a Bot lol. Bus driver was indifferent to the situation. Barely talked the whole time. There was a mess last night as 4- 5 buses were delayed. My bus came 1.5 hours late both to Dallas and Houston terminals. Bad things happen sometimes but the worst one was that nobody knew the exact reason of delay and when buses will arrive at last. So people had to stand in lines for hours in full uncertainity. We were 20 minutes late leaving Montrral but 15 minutes early arriving in Ottawa- pleasant surprise! Can I print my Greyhound Bus ticket online? Yes, you can print the ticket at home and bring it to the station on the day you travel. Alternatively, you have the Pick up at the Station option. For this, you must present yourself at the Greyhound counter before your departure time in order to pick up your printed ticket. Does Greyhound Bus have WiFi on board? Yes, WiFi is available on all Greyhound buses and is free! How many bags can I take on Greyhound buses? You are allowed 1 checked luggage of up to 50 lbs and 1 carry on of up to 25 lbs on Greyhound buses. Additional checked luggage is available at the bus station for a fee of $20. Can I bring over-sized luggage with me on Greyhound buses? Yes you can! As long as there is room under the bus, oversized luggage is allowed on Greyhound buses for an extra fee. The fee varies depending on the size of your luggage and will be paid directly at the bus station upon checking in the bus. Does Greyhound Bus have bathrooms onboard? Yes, there is a restroom on board each Greyhound Bus. There are also stops for rest breaks on some routes. Does Greyhound Bus allow pets onboard? 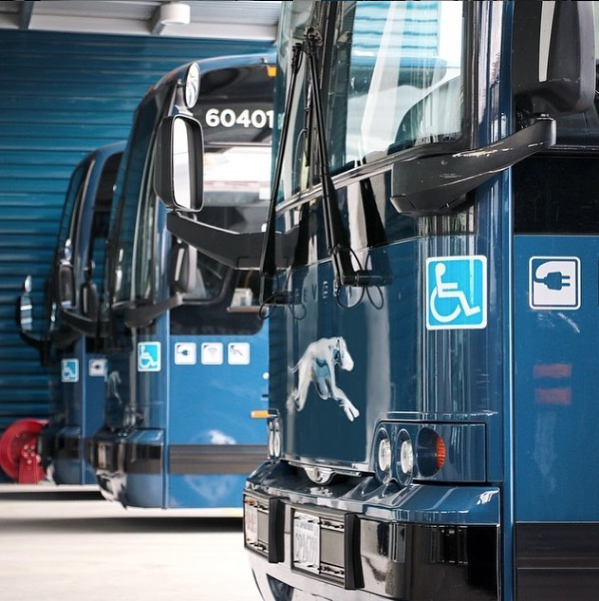 Only service animals are allowed onboard of Greyhound buses. Service animal means any guide dog, signal dog, seizure response dog, psychiatric service dog, sensory signal dog or other animal individually trained to assist, work or perform specific tasks for an individual with a disability. How can I exchange my Greyhound bus ticket? You can exchange your ticket directly at the station before your original departure time. You can only change the date and time, but not the itinerary or name on the ticket. Greyhound charges $20 for this procedure. All Greyhound bus tickets are non-refundable. What do I need to bring with me when traveling into Canada with Greyhound bus? When you cross the border from the U.S. into Canada you’ll need your passport as well as a second piece of identification, which will be checked before you get on the bus. Also, non-Canadian residents who do not have round trip tickets will need to show proof of their exit from Canada. When you reach the Canadian border, all passengers need to get off the bus and collect all their belongings, including checked baggages. You and your baggage will then pass through security, just like at the airport! What do I need to bring with me when traveling into Mexico with Greyhound bus? When you cross the border from the U.S. into Mexico you’ll need your passport as well as a second piece of identification, which will be checked before you get on the bus. Also, non-Mexican residents who do not have round trip tickets will need to show proof of their exit from Mexico. When you reach the Mexican border, all passengers need to get off the bus and collect all their belongings, including checked baggages. You and your baggage will then pass through security, just like at the airport! Can children travel unaccompanied by adults on Greyhound Bus? Children under the age of 12 can’t travel on a Greyhound Bus unless accompanied by someone 17 years of age or older. Children between the ages of 12-16 that travel unaccompanied must have a completed Unaccompanied Child Form and pay the full fare. Busbud is a bus search tool - we include Greyhound routes, schedules and prices in our searches along with many other bus companies. You can compare prices, amenities and times by searching for a route. If you find a suitable trip, you can go ahead and get your Greyhound ticket from us. Note that buses sell out, Greyhound and other operators generally charge a lot more for last minute tickets or for tickets bought in person.